- Sticks are cone-shaped: they are finer at the Nunchaku top (near the rope) than at the bottom. Therefore, the weight is more important at the sticks end making damage to be increase in the event of attack. - Sticks are octagonal: once again, it is made to increase Nunchaku damage in the event of attack. Angles formed by this octagonal shape are destructive. To perform moves powerfully and in an accurate way, theses Nunchakus required a good physical strength according to their size, larger than a common one. That kind of Nunchaku have been made to develop the most damage to the detriment of an easy handling: it is, in fact, quite difficult to handle that kind of Nunchaku, the weight perception make moves less intuitive for a beginner. We can found non conic versions of theses Nunchakus or non octagonal ones: they are in fact our common Nunchaku. 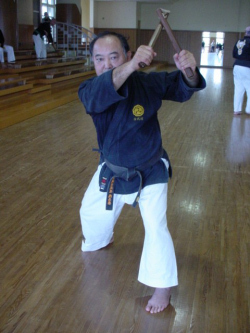 Japanese Nunchaku handling style is taught through Kobudo, teaching also how to handle a staff (Bo), a tonfa and a Kama. Japanese moves, which are in total opposition as regards as the Chinese way of handling, are born of karate: all the attacks are direct without superfluous added moves or techniques. Peoples handling Nunchaku through a traditional Japanese way strike and directly reposition them in guard position. This feature really reflects Japanese state of mind: straight and serious. The result is a very jerky style but really efficient. Kobudo moves are quite basic moves, direct common strikes, some blocks and counter attack techniques. There are no complex moves as wrist spin; the objective is to strike directly. There are also some lock techniques: it is question of block one of opponent limbs to make him unable to move or to throw him to the ground. Beneath its moves simplicity, a long accuracy and strength work is staggers by experienced people. One of the main particularities of Kobudo way of handling Nunchaku is to enter the opponent guard to snap it and to make distance shorter between opponents. It is also a good way to destabilize him, particularly if he’s armed. Like in Karate, Kobudoka (pupils learning Kobudo) start by learning basic techniques (called Kihon), then they try to learn kata forms. Kata forms are in fact a precise moves sequence that Kobudoka have to perform skillfully: with the highest control and accuracy level they can developed according to their experience. Katas form can be common to many schools or specific to a school/teacher. Basics kata forms include few technical moves, but advanced ones can gather more than fifty moves. 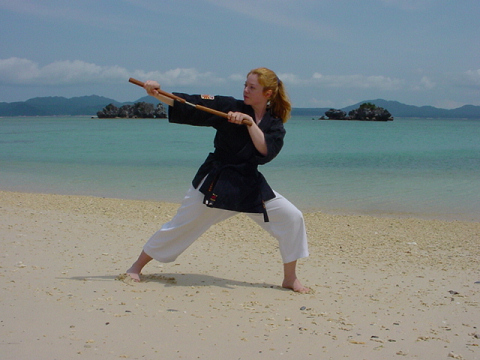 The aim of kata forms is mostly to perform and to link up various techniques. Assessments for next belt degree are, by the way, often based on the knowledge and on the skill level of some specific katas. To coincide with that katas forms learning, pupils also develop their attack power and their accuracy across many specifics exercises. When a pupil reaches a good knowledge and a good skill level, after few years of handling, he is allowed to practice the ‘Renzoku-bunkaï’: another student attacks him with predefined attacks to make the pupil able to stop them or counter them by also predefined techniques. To simplify matters, let’s say that is kata forms for two people. This exercise is firstly performed with low velocity and speed, allowing an easier memorization of moves without injuries. Velocity and global speed are, then, gradually increased. Renzoku-bunkaï is useful for acquiring reflex, for example to link some block moves to specific attacks. It is really helpful in a true fight situation: the pupil will perform the right move face to his opponent attacks. 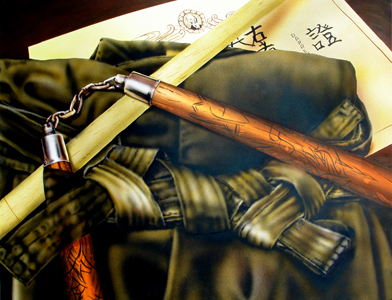 Many weapons are used to attack the pupil handling Nunchaku but the most used is the staff. Next step for a pupil is Kumite: it is in fact a true armed fight situation against another pupil. Years ago, only high level student could be allowed to practice Kumite because a simple mistake while attacking can quickly become fatal. Obviously, the two pupils performing had not to kill each other: the aim was to disarm his opponent or to beat him hollow. But, this way of practice is nevertheless dangerous. Nowadays, pupils are earlier allowed to practice Kumite, using protective clothes and safety Nunchakus to avoid injuries. Theses Japanese techniques are very effective in a real fight situation because they are learnt in a quite realist way throughout Kumite instruction.